Most states have specific laws regarding newborn screening. In Massachusetts you may refuse for religious reasons. If you do so, you may be asked to sign a refusal form. This form relieves your doctor of liability for damages that result from a disorder that could have been detected by screening. Chapter 111: Section 110A Tests of newborn children for treatable disorders or diseases Section 110A. The physician attending a newborn child shall cause said child to be subjected to tests for phenylketonuria, cretinism and such other specifically treatable genetic or biochemical disorders or treatable infectious diseases which may be determined by testing as specified by the commissioner. The commissioner may convene an advisory committee on newborn screening to assist him in determining which tests are necessary. The department shall make such rules pertaining to such tests as accepted medical practice shall indicate. The provisions of this section shall not apply if the parents of such child object thereto on the grounds that such test conflicts with their religious tenets and practices. Notice of Religious Exemption to Vaccinations To whom this may concern, We, parents names, are exempting our child, (child's name,)___________________ from all vaccinations because it conflicts with our sincerely held religious belief. 1) Upon certification that a doctor has personally examined the child and found "that his health would be endangered by such vaccination or by any of such immunizations." 2) No "child whose parent or guardian states in writing that vaccination or immunization conflicts with sincere religious beliefs shall be required to present" the certificate in order to be admitted. in the case of varicella, upon presentation of laboratory evidence of immunity or a statement signed by a physician that the student has a history of chickenpox disease. Longer letter that may be modified for your individual use on VacLib.org. They are in PDF and .RTF format, as PROOF that your son is allowed religious exemption. It should be downloaded and printed out. As per General Laws of Massachusetts chapter 76, section 15C (Vaccination and Immunization; Exceptions by Reason of Physical Condition or Religious Belief) I am exempting myself from vaccination because it conflicts with my sincerely held religious belief. Waiver is at bottom of page 2. See the Registrar for information about waiving this requirement. Waiver is on page 2 of the pdf file. 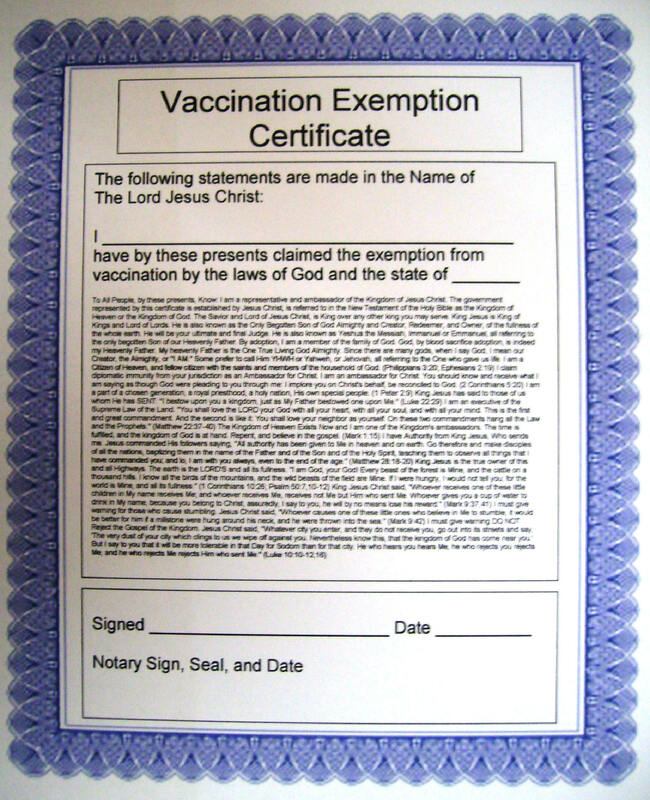 You will need to submit your statement of religious exemption for other required vaccines. Use the letter at Colleges or you can modify this AFFIDAVIT. Be sure to cite the law at the bottom of the affidavit. Edit to satisfy the college or university requirements. Our legal rights are guaranteed by the free exercise clause of the First Amendment to the U.S. Constitution. States can only go against this if they can prove a compelling state interest is at stake. But recent court decisions have upheld the rights of individuals seeking exemptions from immunizations based upon "personal" religious beliefs. [Sherr and Levy vs. Northport East-Northport Union Free School District, 672 F. Supp. 81, (E.D.N.Y., 1987); Allanson vs. Clinton Central School District, U.S.. District Court, Northern District Court, Northern District of New York (84 CV 174), 1984; Campain vs. Marlboro Central School District, Supreme Court Ulster County Special Term, November 15, 1985; Brown vs. City School District, 429 NYS2d 355; Maier vs. Besser, 73 Misc.2d 241]. On the U.S. Supreme Court level in Frazee v. Illinois Dept. of Security, 489 U.S. 829, 1989, it was found that a state may not deny an exemption simply because a person is not a member of a formal religious organization. In addition, the Supreme Court has noted that nontraditional beliefs, including secular humanism, atheism, and nontheistic faiths, are all "religion" for the purpose of free exercise analysis. The Supreme Court in Fowler v. Rhode Island, 345 U.S. 67 (1953) held that it was "no business of the courts to say what is a religious practice or activity for one group is not religion under the protection of the First Amendment." * Nowhere in the above text does it mention that a letter from clergy is required.